Even in electronics and computer business there are a few products that stand the test of time. One of these few products is the Amazon Kindle ereader. Especially, the entry level model with basic features is a simple, easy-to-use product that does what it supposed to do and doesn’t cost too much. Now, Amazon has updated the basic Kindle, making the new product already the 10th generation device version. The key improvement in the 2019 model of the basic Kindle is front light. In practice, it means that you can read in a dark corner (or in a bedroom without any lights on) because tiny lights in the ereader can be switched on to light up the display. The other extreme – reading in direct sunshine – is perfect reading environment with an ereader because of the way the E ink display technology used in these devices works. Another improvement in the 2019 Kindle is the possibility to listen to audiobooks. Audible books can be listened to on a Bluetooth device, like headphones or loudspeakers. The display resolution is low (600 x 800 pixels), storage space for ebooks is relatively small – only 4GB (it is still good for thousands of books), and fancy features are missing, but that is exactly the point with an entry level product. Amazon has set the price for the 2019 Kindle at USD 90. 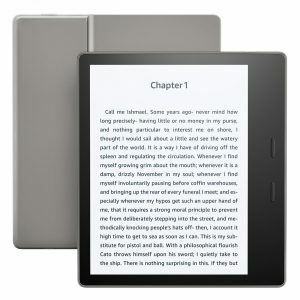 Here is a video recorded by The Ebook Reader blog that shows the 2019 Kindle ereader. 6 inch display with front light. Free cloud storage for all Amazon content, like Kindle ebooks. Wi-Fi connectivity for internet: 802.11b/g/n standards with WEP, WPA, and WPA2. VoiceView screen reader is available for a Bluetooth audio device. It provides spoken feedback allowing you to navigate your device and read books with text-to-speech (available in English only). Reader can adjust font size, font face, line spacing and margins. Ebook, document and image formats: Kindle Format 8 (AZW3), Kindle (AZW), TXT, PDF, unprotected MOBI, PRC natively; HTML DOC, DOCX, JPEG, GIF, PNG, Audible audio format (AAX). Weeks of battery life, but it varies based on light settings, wireless usage. Audible audiobook streaming over Bluetooth will affect battery life as well. Battery fully charges in four hours from a 5W USB power adapter or computer via USB cable. Dimensions 6.3 x 4.5 x 0.34 inches ( 160 x 113 x 8.7 mm). Weight 6.1 oz (174 g). 2019-04-14 by Klaava in Amazon, Ereader. Tags Audible, audiobook, basic, entry level, front light, Kindle. In the very early days of the Kindle ereaders, Amazon marketed a product with a tablet-size screen. It didn’t live for long, although second-hand units are still readily available. Then, Amazon simply decided that six inches is the only proper size for ereaders. Now, the company has changed its mind. The Kindle Oasis with its seven-inch E ink display enters Amazon into competition with ereaders that come with 7.8 and 8–inch screens. As we recently wrote, this screen size has quickly become a new attractive product category in ereaders. –	The unit is waterproof: read on a beach, in the bath, and it is also more durable for travel. –	Audible audiobooks are compatible with the device. –	VoiceView screen reader can read aloud text on the screen. –	Front light illuminates the screen for reading even in dark. –	Free cloud storage space for all content downloaded from Amazon. –	Wi-fi and/or mobile network connectivity depending on the model. A couple of things to notice in the Kindle Oasis 7 are that there is no headphone jack, but you have to have Bluetooth headphones, the ereader still doesn’t open EPUB-formatted ebooks, and models with lowest price tags come with ads. The prices start from 250 USD for the seven-inch Kindle Oasis. The cover must be purchased separately (if you need one). The kindle Oasis 7 base price point is at the same level as competitors’ 7.8 and 8-inch models. Why 7.8 and 8-inch are becoming so popular that even Amazon decided to make a product that has display larger than six inches? Reading is more comfortable on a larger screen. This is, of course, very personal. For instance, I like to read from a 10-inch screen. More texts fits into a page, pictures look better, and if I enlarge the font, it can still display a fair amount of text. For a balanced view on the pros and cons on the different screen sizes (from 6 to 13 inches) of ereaders, read this article. Hands-on video of the 7-inch Kindle Oasis by Cnet shows how significant the size difference is to the 6-inch model. 7-inch display technology with E Ink Carta. 300 ppi pixel density, 16-level gray scale. Built-in light for reading even in dark. Waterproof (IPX8), tested to withstand immersion in 2 meters of fresh water for 60 minutes. Audible audiobooks can played on the ereader. 8 GB built-in storage. Holds thousands of books or over 35 Audible audiobooks; 32 GB holds thousands of books or over 160 Audible audiobooks. Bluetooth. Advanced Audio Distribution Profile (A2DP) support for audio streaming from Kindle Oasis to your Bluetooth speakers or headphones. Audio/Video Remote Control Profile (AVRCP_ support to remotely control playback of Audible audiobooks on Kindle Oasis from compatible Bluetooth devices. Bluetooth speakers requiring PIN codes are not supported. The VoiceView screen reader, available over Bluetooth audio, enables access to the vast majority of Kindle Oasis features. Ability to Invert Black and White, adjust font size, font face, line spacing and margins. Ebook formats: Kindle Format 8 (AZW3), Kindle (AZW), TXT, PDF, unprocted MOBI, PRC natively; HTML DOC, DOCX, JPEN, GIF, PNG, PMP through conversion; Audible audio format (AAX). Dimensions 6.3″x 5.6” x 0.13-.33” (159 mm x 141 mm x 3.4-8.3 mm). Battery life up to six weeks, based on a half hour of reading per day with wireless and Bluetooth off and the light setting at 10. 2017-10-14 by Klaava in Ereader. Tags 7-inches, Amazon, Audible, Kindle, Oasis, waterproof.